Cotton is one of the most useful, naturally occurring insulators and is used from ancient time for heat resistance. However, it also has moderate electrical insulation properties in dry condition. In certain low voltage applications, cotton yarn is used as wrap-around insulators, which proved to be long lasting, flexible and tough insulation. Cotton yarn soaked in impregnating resins and cured properly can be used for critical applications like servo stabilizer windings, magnet coils etc. Cotton Covered Copper Conductors are exclusively used in dimmer stat windings of 40, 50, 75, 80, 90 Amp or even higher capacity. SWG 6, 9, and 11 are commonly used for this application. 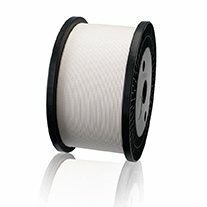 The wires are wound in form for toroid windings, which is further dipped in epoxy resins and cured / baked to form a solid, hard, tough insulation. As per IS 7391 part 1 for round copper wires, IS 7391 part 2 for rectangular copper conductors.